Thank you, Husain Family Foundation, for supporting Wine To Water’s Program in Nepal! Wine To Water’s program in Nepal is focused in the Madi Municipality, located in the Chitwan District. The communities here are surrounded by the Chitwan National Forest on the West and and the border of India on the East. In this pocket of space, separated from the resources in the rest of the Chitwan District, people lack access to safe and sustainable water sources. In Madi, we have found that community water systems cannot meet the demands for all households. Women and children are left to walk great distances to the nearest sources to get water for all of their drinking, cooking, household, and farming needs. Schools are unable to source water for children during the school day. Lack of education on sanitation and hygiene has led to numerous health problems. The Kalyanpur project is a complex, three-sourced water system designed on the basis of solar technology. These three sources-- river, spring and groundwater-- converge at the bottom of the hill in a Sump Well and are then lifted up to the top of the hill through the solar panels. The water is stored there in two 20,000 liter reservoir tanks before being gravity fed back down the hill into 98 individual tap-stands, including one for the community school. A total of 9,721 meters of pipe carry this water to the farthest corners of this community. The Water User Group Committee (WUGC) is an 11 member group who organizes and leads all aspects of community engagement, including community labor and financial investment of this project. This WUGC is led by a male president, Mr. Gyan Bahadur Kafle, who is around 70 years old and has become an exemplary figure and role model for everyone in the community. The GESI (Gender Equality and Social Inclusion) was considered as a high priority while forming this WUGC. Along with the formation of the WUGC of Kalyanpur, our team established an Operation and Maintenance Fund (O&M fund). This ensures a self-sustaining fund for the continuing progression of this water project long after W|W has finished our program here. 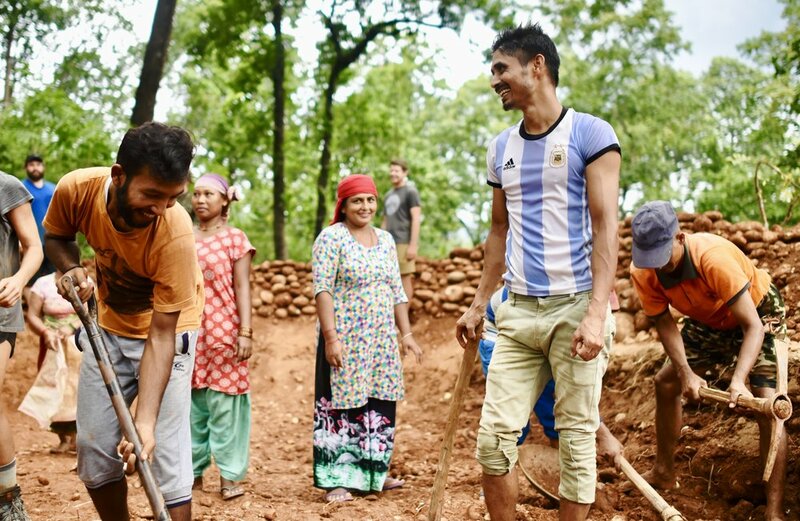 The ground-breaking for this holistic approach to WASH in Kalyanpur began in August when the W|W Nepal team, the community of Kalyanpur and all stakeholders in this program prepared for this construction with pre-construction trainings. Construction ensued over the course of the fall and into the winter in partnership with the community, field staff, and W|W volunteers. These teams were able to dig the trenches for this 9 kilometer project, develop the two natural spring sources by constructing concrete chambers, create the sump well and connections to the two existing wells, build the protective wall around the sump well, connect the solar panels to the system, and begin construction on the reservoir tank. The materials you helped provide include the fittings, solar panels, HDP pipes, joints rebar, etc. These were all purchased to help start the pipeline digging process and construction of the reservoir tanks. The two 20,000 liter tanks took a total of three months to complete and were finalized at the end of March. 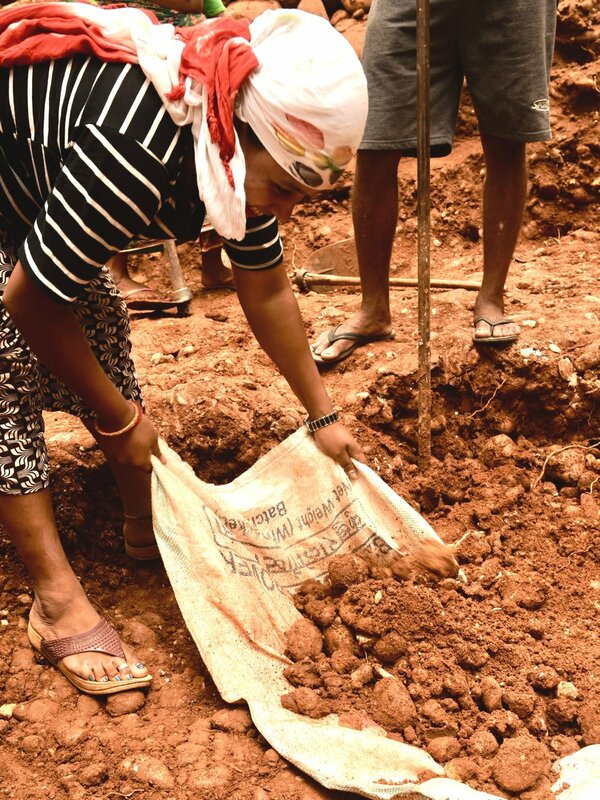 Again, the entire community, field staff and W|W volunteers worked together to first dig the two holes, cement the base, and use tubes, rebar, and concrete to construct the frame, and backfill the holes to close in the structures. Since, all tap-stands have been constructed, the sectional valve chamber has been completed, and the distribution pipelines were connected to each household. This program in Kalyanpur will be completed by the end of April after all the pipes are fit on the intake tank and trenches are backfilled after all pipelines have been laid. Once the system is complete, a month of testing will be done to ensure the system is providing a steady flow of water. Then, a water quality test will be done on the water from the household taps. The results will tell us if we need to move into household water treatment community wide, and we will work with the community to identify the best type of intervention. The Water User Group Committee (WUGC) is crucial during all the construction that is detailed above and for the overall sustainability of this program. To aid the WUGC, a Social Mobilizer and a Village Maintenance Worker (VMW) are appointed to support the construction process in Kalyanpur. As social mobilizer, Mrs. Sangita's Ghatane job is to inspire the people of Kalyanpur's ownership and implementation of their water project. By supporting our field officer with meetings and trainings, fostering community involvement with constant communication, taking surveys and recording data, gathering funds, and holding people accountable for their work, Sangita's job is of utmost importance. As the Village Maintenance Worker, Mr. Baburam Gharti is responsible for maintaining the water system, collecting water tariffs from each household based on how much water they are using and continue to engage people in using and caring for the system. This role is self-sustaining through the water tariff that each household pays every week to use their water. Every household has the choice of which way they would like to contribute but everyone is expected to have a “buy-in” in some way. While some households may be able to afford the cash contribution, many households live on a limited income and this is not possible. Sweat equity directly brings down the cost of the program, because community members are providing their own time and hard work to invest in the program. They collect local materials (gravel, sand, etc. ), help in digging trenches, and contruction of the RVT. Truly, the people of Kalyanpur are supporting each other, creating change for themselves, and supporting the cause of clean water in their community. This is their project. Since the community takes an active role in funding their project. The WUGC has three mass meetings during the project implementation phase called social audits. During these social audits, the community members, W|W Nepal team, and all other stakeholders gather at the temple in the most central part of the community. The Secretary of the WUGC and Social Mobilizer present on cost of construction to date, stating all of the the stakeholder’s contributions. Social Audit One and Two have happened during the project construction. The last social audit will happen when the project is completed at the end of April. 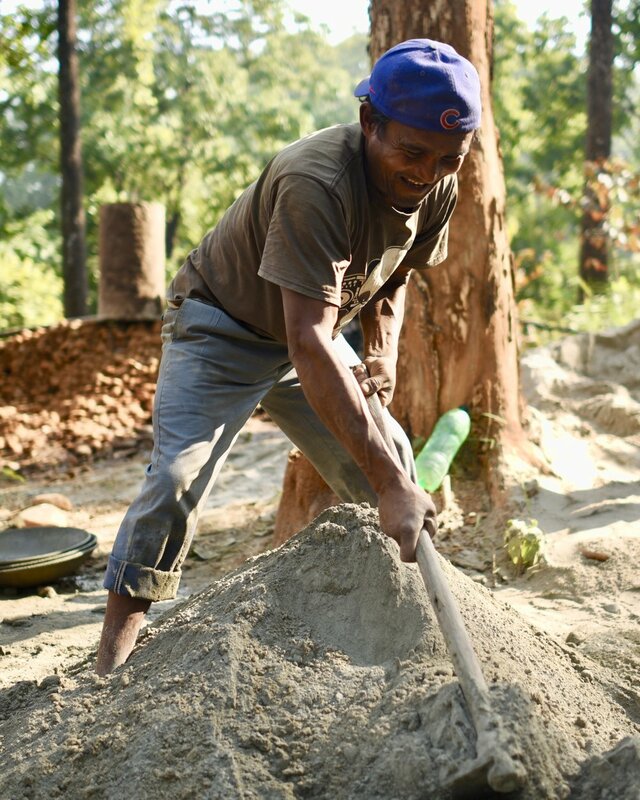 During this last social audit, W|W Nepal will host a post-construction training to better ensure that the community can care for their own water system. Building off the role of the Village Maintenance Worker, the committee will learn how to properly care for their individualized tap-stands and record the monthly water tariff. As in all programs, W|W seeks to provide holistic WASH programs in communities all around Madi. In partnership with Nepal’s government, the standard for community development is to achieve total sanitation. This means that on top of every household having access to one tap-stand, each house must also have access to a latrine. In Kalyanpur, there are 20 households that do not have access to a toilet. In partnership with the local Ward office, W|W Nepal is planning to help train and provide technical support for the construction for these remaining households with eco-sanitation latrines. The latrines are designed to capture urine, which can be used for fertilizer. This urine fertilizer is then used in conjunction with the third phase of our program, livelihood training through agriculture education. The livelihood training is focused on approaches to improving people’s lives through the presence of clean water and with this, we implement a program from growing seasonal crops year-round through tunnel farming. We hope that farmers will use this initiative to be competitive in the local markets and generate income here. Our work in Madi has shown tremendous growth for our organization. In meeting the communities where they are at with an asset-based approach to development, our phased-series has shown success in terms of empowerment, ownership and opportunity for the people of Kalyanpur and all of the Madi Municipality. We hope this report shows you how much your contribution to the Kalyanpur project has transformed lives here-- but this water system is only the beginning in for the people in Kalyanpur. With water, opportunity for improved health, education, women’s empowerment, and socio-economic development are possible. THANK YOU! We are grateful for your continued support!